The term is fast drawing to an end and we are all pleasantly anticipating the holidays, especially as the days grow colder and as we long for cosy late mornings. It has certainly been an extremely long and busy term with many events that have taken place. Welcome back: Mrs F Kuhn and Mrs J Poole who have returned from accouchement leave. Farewell: Mrs C Fourie and Ms M Prinsloo who assumed locum positions. Locum appointments: Ms A Selvarathnum has been appointed a GB locum for Mrs Brislin. New Appointments: Mrs H Smith (Braille Facilitator) and Mr V Bipraj (new driver). Foundation Phase learners have been busy with various exciting projects. 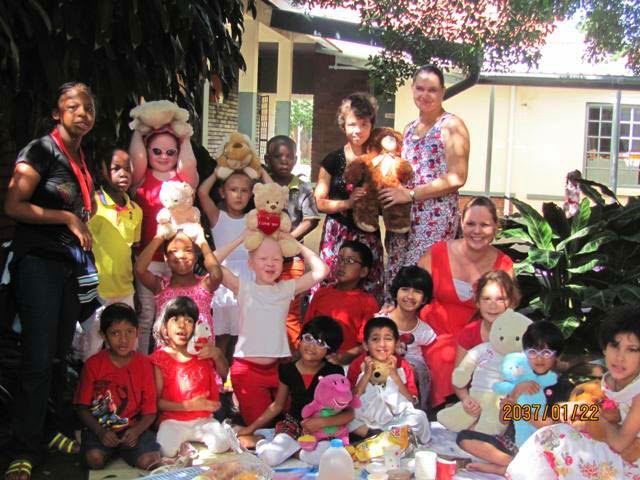 All FP Learners enjoyed the Teddy Bears Picnic with their peers in the Intermediate Phase. The weather was beautiful, the treats were special, and sharing all of this with friends under the Open Air tree made for a memorable morning. Grade R and Pre-school have continued with their visits to Glenridge Pre-school. The learners at both schools look forward to these special mornings painting, building, climbing, racing bikes, playing dolls and making new friends or seeing the same old friends again. Read-a-thon 2013 2nd term went off well, with learners encouraged to read for fun and raise funds. Many learners discovered new books to be read in their community libraries. Parents are encouraged to enroll their children in the closest community library, so as to have access to all the amazing children’s books available. Readers are leaders after all! The Grade Ones enjoyed their visit to the Flag Animal Farm, seeing how cows are milked and feeding some of the animals being the most fun. The Grade Twos visited Durban’s much loved Mitchell Park. They enjoyed looking at all the animals and were delighted to play in the Play area designed for children living with disabilities. The Grade Threes and Junior Bridging delighted in all the colourful, exotic birds at the bird park and learnt a lot about our own beautiful bird life. A few of our Foundation Phase learners have been testing out their arms and legs at the DHS Bouldering wall. The enthusiasm is catching and the learners are enjoying this form of exercise. We thank DHS for allowing us to use their Bouldering wall and for their help in one-on-one training for each Open Air child. We hope to eventually take part in competitions and grow this sport at LSEN school level. Our Music students are doing well with Miss Matthews, Miss Sweet, Baba Mkhulu, George, Brett and Phumlani, who have dedicated Thursdays and Friday for music lessons. Our learners have been introduced to the Ukelele, Euphorium, and trumpet, and continue to enjoy the Clarinet and Recorder groups. Danito Mondlane will be our first student to write his Music exams in August. Well done and thank you to the Durban Music School teachers and the generous donors for this project. Playball has been introduced to our school since Term 1 and has grown from strength to strength. There are currently twenty learners participating in Playball and they are thoroughly enjoying it. We would like to thank the parents who have been supportive of this initiative, and hope to see it grow even more in the terms to come. We would also like to extend our thanks to Griya who has been running and organizing this activity. Practical Assessment Task (PAT): The Grade 12 PAT-1 and PAT-2 was a success for 2013. Learners were prepared and well motivated. PAT-1 included themes and learners had to do a researched-based assignment which they thoroughly enjoyed. Their tables were decorated according to their countries of choice. Parents and educators were invited to these luncheons. The final PAT will be held in August 2013 and will be moderated by the subject advisor and external educators. We hope our learners’ practical skills meet the subject advisor’s requirements. The Grade 8, Grade 9 and Grade 10 learners were invited to attend various speech forums this term. Eve Duma (Chairman), Thea Harman, Sibusiswe Dube and Lethu Dube participated at Glenwood High School on Wednesday 17 April. Although our teams did not win, the Grade 8 team was commended on their confidence and ability to keep the conversation flowing. Nokukhanya Xhakaza in Grade 9 was commended on her brilliant ability to chair the team and to ensure they stayed on topic. The adjudicators commented on the enjoyable discussion the Grade 10 team delivered and congratulated them on their well-projected voices. Thank you to all the educators involved in co-ordinating the various speech forums and ensuring that the teams presented speeches that were of the highest quality. Sanele Xaba (Grade 12) was the only participant from OAS. He competed at Westville Girls’ High School on 8 May. Sanele gave an excellent speech on the effect of reality shows on young people. The winner in that round was Ekta Bramdev from Westville Girls’. We would like to congratulate two learners’ who have been awarded full bursaries from the Department of Sports and Recreation. Their names are Olwethu Mndaweni (Grade 12) and Smisokuhle Mntungwa (Grade 10). Due to their achievements in KwaZulu-Natal Sports over the past few years, as well as consistently good academic results, they have been awarded full bursaries for the duration of their time at Open Air School, with the option of renewal for any tertiary studies they may want to fulfill. On 3 May 2013 two learners from Open Air School, Ranetsi Manyoni and Sphelele Dlamini, attended the UKZN Westville Disability Awareness Day. This was the first time they have ever done this. Open Air was invited to show the learners on how to play wheelchair basketball. Both played extremely well and all the UKZN students were very eager to play. There were also many talks and skits about people with disabilities and the challenges they face in life. Many photos were taken of the event and Open Air School will be working with the UKZN students to setup more disability programs. One thing the learners will remember from the event and which the UKZN students promoted is that people shouldn’t view themselves as having a disability, but in fact view themselves with having a unique ability. National Championships Zamageba Zulu represented the KZN Boccia Team at the National Championships held in Pretoria, during the April Holidays. Zama won a silver medal in the Team Event. Well done, Zama! Open Air School was proudly selected to be one of seven schools to participate in the F1 in schools challenge at the Top Gear Festival 2013. Aaminah Pharos, Bongiwe Dubuzana, Phumlani Bhengu, Smiso Mtangwa and Minenhle Zulu formed part of TEAM OASIS, who represented Open Air School at the Festival. The learners had to design and create a F1 car of the future and race it during the Top Gear Festival on 15 and 16 June 2013. The learners were also responsible for the fundraising and marketing of the car. Many thanks go out to Ms N Van Wyk, and Mrs B Naidoo, for all their hard work and for going above and beyond the call of duty. As part of the fundraising initiative towards the Top Gear challenge, the Grade 11 learners hosted a ‘Movie Day’ during an extra-mural session. Learners were treated with delicious popcorn whilst they watched the hilarious animation, ‘Despicable Me’. Many thanks go out to Mrs B Naidoo, Mrs K Brockett, Mr T Brockett and the Grade 11 learners for their work in putting this event together. Mothers Day was a very special occasion, with the Open Air moms being treated to tea and cake in the hall after being entertained by their children. This was a very emotional, heart-warming time for many moms, grannies and special guests. The Durban Music School Jazz Band added a cool groove that made for a great finale. A “first” in the history of Open Air School was the Open Air Fathers Day Celebrations held on 10 June 2013. The Grade 3 and Junior Bridging Class opened the ceremony with an amazing performance of “The Circle of Life”. The learners handed over a large chocolate medal to Mr Moodley as the “Father” of Open Air School – representing all other fathers for the day. Each class performed an item, including jokes, songs, poems and dance. Mr Moodley praised the fathers present and encouraged more fathers to join this annual celebration celebrating our dads and what they stand for. Tea and cake was served afterwards. We look forward to 2014 for more dads to join us. Thank you to Mrs Lottering for co-ordinating this event. This year our parents’ evening was held on 24 April 2013. Parents from Pre-primary to Grade 12 were invited to attend. Although a large number of parents made the effort to attend and speak to the educators about their children’s progress, it was disappointing to note that many parents of learners in the High School Phase did not attend. The parents’ evening provides an excellent opportunity for parents to speak first hand with educators about their child’s progress. Furthermore the educators are seated in one venue making it convenient for parents to find the respective subject educators. Parents are urged to take advantage of this. A similar meeting will be held next year, and hopefully more parents will attend. Those parents who were unable to attend this year’s parents’ evening, can still phone the school and make arrangements with their child’s class teacher for an appointment to discuss their child’s progress with subject educators. Late last year Mrs James sent an email to Damon Beard of East Coast Radio’s “Big Favour” to request help in doing up a portion of our school garden. Damon Beard contacted Tanya Visser of The Gardener Magazine who took up the cause on our behalf. Tanya was able to secure sponsorships from Van Dyck Carpets, Classic Concepts and The Gardener Magazine. Van Dyck Carpets laid the aero turf, a type of synthetic grass, and the process of laying this product is featured in the June 2013 edition of The Gardener Magazine. Classic Concepts donated seating for the garden area and The Gardener Magazine supplied the pot plants. This garden is now being utilized as a seating area for our Matric learners. We are extremely grateful to all our sponsors for their contributions. This area has provided a much needed facelift to a portion of our school grounds and we are certain that it will provide lots of joy to our school community for many more years to come! PVC learners participated in a work experience programme arranged by the Occupational Therapy Department. The programme aimed at practicing work skills and work etiquette learnt in therapy and was run in the second term during the exam weeks. The learners spent two weeks at Mr Price at the Pavilion where they were afforded the opportunity to develop professional relationships and be fully included into the store’s functioning. All the learners received excellent feedback and they thoroughly enjoyed the opportunity to participate in a real work situation. All PVC learners should be proud of their behaviour and the quality of work performed. The OT department hopes that the good standard of this term’s programme will be repeated in the future. Well done to all PVC learners. Thanks also to Ms Martens (OT), for the time and effort in organizing such an invaluable experience for the learners. An urgent appeal is being made to parents to offer help and support in the forthcoming Market Day on Saturday 31 August 2013. Please fill in the form overleaf to indicate the type of help you can offer and hand back to Mrs Lottering. Please help – the school needs you and your extended family! Parents are requested to not send their children to school if they are sick. Parents are reminded that sick notes or doctor certificates need to be sent to the Medical Department when your child has been absent. Please keep us informed of any change in your child’s medical condition and provide us with updated medical reports after any medical procedures such as operations, doctor consults or change in medication. There have been recent infestations of lice and nits. Please check your child’s hair routinely before sending them to school. Please go to the pharmacy/local clinic to get treatment for this. Children are NOT allowed to return to school if they still have nits and lice, and must have a clearance certificates from their local clinic. Normal therapy programmes were followed throughout Term 2. However, during the 3-week senior learners’ exam period, all therapists were involved in scribing, which disrupted the frequency of both individual and group therapy. A reminder: it is compulsory for all learners in wheelchairs to have a seatbelt. Seatbelts can be purchased from the Physiotherapy Department for R30.00. This term has been a diverse one in terms of the guest speakers that have presented at our meetings. In April we had Carolien Botes who discussed the benefits of Kinderkinetics for children, especially those with ADHD. She is a qualified Kinderkineticist and shared information about what this exercise programme involves. Doug Berry and Jenna Oertel from EQ-Advantedge joined us in May. EQ-Advantedge is an organization that does neurofeedback and offers emotional intelligence courses. Mr Berry touched on what these services entail and the benefits that they have for children who experience emotional and/or behavioural difficulties. Our most recent speaker, Gabi Kell, is a counselling psychologist who discussed various behavioural intervention strategies that parents can implement at home in order to encourage desirable behaviour. Next term we are hoping to have a dietician speak about healthy eating choices, especially for children with ADHD. We are also looking at possibly having another presentation, by a psychiatrist, regarding medication. Should anyone like further information regarding our Parent Support Group or any of the speakers, and/or would like to be put on the Parent Support Group mailing list, please contact Miss Robarts. Open Air School would like to encourage parents/caregivers to attend these meetings as they provide valuable parenting advice that can be used with any children, not only those with ADHD. Thank You to Miss Robarts for the time and effort in co-ordinating the above events. On 16 May 2013 an anger management workshop was hosted by Dr John Buswell from Rapewise. Two sessions were held; one for learners from Grade 8 to Grade 12 and PVC, and one for all staff members. The purpose was twofold: firstly to understand the sources of anger and secondly how to manage anger. Both staff and learners have started implementing the ideas they got from the workshop. Mr Buswell will be presenting a second series of workshops to learners on 13 September 2013. The Gr 4 to 7 and JBC and SBC learners will be workshopped on challenges that the primary school learners face. The Grade 8 to Grade 12 and PVC learners will be workshopped on the challenges that secondary school learners face. We are looking forward to this exciting event. If there are any queries regarding the above workshop, please contact Dr Naidoo, the Educational Psychologist. We wish all our Muslim staff, learners, donors and friends well over Ramadaan, which begins during the last week of the holidays. HAPPY HOLIDAYS & KEEP SAFE!